Held annually at rotating sites in Iowa and Illinois, this year’s Farm Progress will run September 1-3 at the show grounds in Decatur, Illinois. Farm Progress attracts thousands of producers from the Heartland, across the country, and around the world, bringing together more than 600 exhibitors every sector of agriculture equipment, technology, and services to create a “world’s fair of agriculture. Salford Group will be represented by a host of territory managers supporting Heartland dealers, including Keith Belt, David Shearer, Jim Danielsen, Dave Gunkelman, and Jason Hinners. The team will work from a pair of booth locations, 805 and 1112, to accommodate equipment from the company’s Salford tillage and seeding lines, as well as Valmar application and BBI broadcast spreaders. Historically, Salford Group and its legacy companies have chosen Farm Progress as the stage to launch new equipment that makes an economic impact on the farming operations of producers, and 2015 is no different. For this year’s Farm Progress, Salford is rolling out the breakthrough PathFinder, a steerable undercarriage designed to carry aftermarket dry and liquid fertilizer tanks for strip-till and row crop application. The PathFinder, designed to fit many aftermarket tank types, was created with Salford’s most recent acquisition in mind, the Valmar Airflo line of application products, including the Valmar ST-6 and ST-8 dry product delivery tanks (also on display at Farm Progress 2015). Other features of the PathFinder include a steerable axle that can be adjusted from 120 inches up to 160 inches, developed to meet row crop and controlled traffic farming requirements, as well as standard 380/90R46 row crop tires and high clearance axle design also allow the machine to enter the field for later season applications. 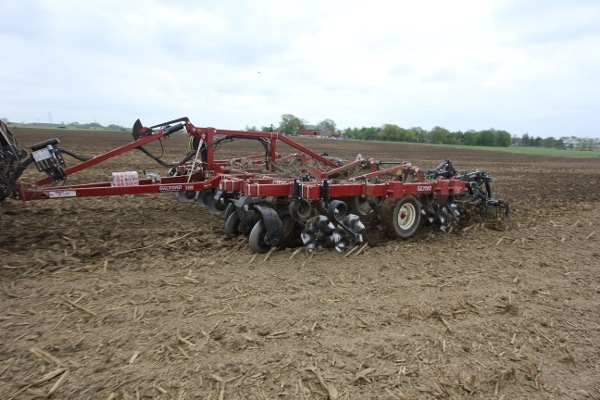 Pathfinder also comes with a universal, double ball hitch, so that the cart can be coupled with virtually any leading tool bar, strip-till or tillage implement or planting equipment. In addition to the new Pathfinder, the Salford team will be showing the AC2000 air cart, with poly tanks and stainless steel metering system. The AC-2000 is a tow-behind or tow-between model, able to hold seed or fertilizer without degradation of the tank. Attendees should be sure to check out the brand new hybrid tillage beast from Salford’s Independent Series for true vertical tillage. Launched earlier this summer at Canada’s Farm Progress Show, the I-4200 is built for soil productivity by combining elite residue mixing and superior field finishing capabilities seen in previously introduced I-Series machines. The I-4200 is optimized for Salford seeding and fertilizer application attachments including Switchblade hydraulic shanks featured at Farm Progress 2015. Switchblade hydraulic shanks allow for the combination of multiple operations into one pass, therefore multiplying the productivity factor of the machine. At Farm Progress 2015, there’s even more from the Independent Series, with the I-1200, I-2100, and I-5100. The I-1200 is field finesse at its best, capable of producing the finest surface tillage available. Designed with 40 percent more blades and 39 percent more weight per machine than the standard I-1100, the I-1200 delivers superior seedbed preparation. The I-1200 on display at Farm Progress features Salford’s Flex Finish harrow systems to produce a fine, level field finish. For those seeking raw power, the I-2100 delivers a jackhammer effect that more than matches up to tough ground conditions. The I-2100 has been engineered for compatibility with I-series seeding and fertilizer attachments to allow producers to combine field operations saving fuel and man hours. The longest tillage frame in the I-Series, the I-5100 is the series’ first full primary tillage tool. From Salford’s field cultivators, the company will feature a two-piece, S-tine model, offering improved field leveling and commodity incorporation. Another recently-launched product on display at Farm Progress 2015, from the recently acquired Valmar application lineup, is the Airflo 8600. A high-capacity, pull-type fertilizer spreader, the Airflo 8600 features pneumatic booms available up to 60 feet. The 8600 combines mammoth hopper capacity with precision metering delivered by a ground-wheel-drive system that adjusts application rate on-the-go, ensuring uniformity regardless of ground speed. Also on display from Valmar at Farm Progress 2015 is the 55 Series Implement-mount Granular Applicator. When paired with Salford tillage machines, the 55 offers a great combination for planting seed, as well as the application of herbicides and insecticides. The 55 Series also features Valmar’s vaunted precision metering system for unmatched precision in on-the-go application rate adjustment and uniformity, regardless of ground speed. Finally, the Salford Group will bring an arsenal of precision broadcast spreaders from the BBI lineup to Farm Progress 2015, showcasing three powerful hydraulic models. MagnaSpread is the industry leader in cost-in-use, a measure of precision and efficiency that drives higher yields, reduced waste, and greater profitability from targeted application of fertilizer and lime. An option-rich line, MagnaSpread is available in a variety of sizes for applications ranging from small to mid-sized farms and golf courses all the way to versions optimized for large-acreage farms, featured in the Producer Series. All of the company’s hydraulic models feature next generation precision farming technology as standard equipment with BBI’s recently-launched Task Command System. Managed through a painted-screen virtual terminal, the Task Command System features applications for field guidance and variable-rate application of nutrients. Endurance is the industry leader in the application of litter and a wide range of organic materials. Like MagnaSpread, Endurance is also available in a variety of hopper sizes, in pull-type and truck-mount options, and is optimized for precision agriculture. Javelin, also from the Producer Series, is the first spreader on the North American market to achieve a true spread pattern and drive interval of 120 feet. Optimized for mid-season top-dress applications with special tires to minimize soil compaction, Javelin features the largest capacity of any single-axle spreader on the market. Javelin’s axle adjusts from 90 to 120-inch track widths to meet different row spading needs. For more information on the Farm Progress Show, also known as “the world’s fair of agriculture,” visit the show website at www.farmprogressshow.com.